Crawling around under your vehicle to safely position your conventional jack can now be a thing of the past. With an X-Jack, simply place the unit on the ground beneath the side of the vehicle to be raised and connect the hose to your tailpipe. When the engine is started, the jack inflates. With a lifting capacity of 8800 pounds, an exhaust jack is the fastest way to lift your vehicle up to 30 inches. 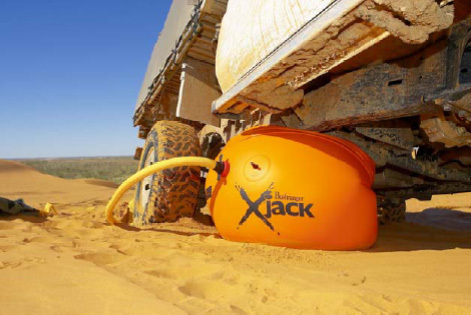 Bushranger product engineers recognized that conventional jacks were not suitable to all types of terrain. In unstable areas of mud, sand and snow, the exhaust jack offers a wider footprint to avoid sinking and uses specially designed, triangular shaped feet to keep the unit firmly grounded. For ease and greater stability, this unit is designed to be safely placed under the side of the body rather than positioned under an axle like a traditional jack. A solid hard plate integrated in to the top of the X-Jack along with additional side curtains offer maximum protection against punctures. The X-Jack also offers a secondary inflation point for a 12 volt compressor and for maximum speed, the compressor and the exhaust hose can be connected at the same time!